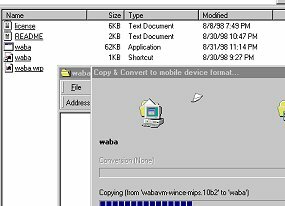 Using your Windows CE file explorer on your desktop, create a "waba" directory under the "\Program Files" directory on your Windows CE device. Copy the waba.exe and waba.wrp files contained in the WabaVM distribution to the "\Program Files\waba" directory created in step 1. Copy the waba.lnk file to the "\Windows\Start Menu\Programs" directory on your CE device. This creates a shortcut to the waba.exe program installed in step 2 and the shortcut will appear in the Start->Programs menu. That's it. You can check if everything is installed correctly by running the waba program. You should be able to find it by clicking on the "Start" button and looking under "Programs". If you run the waba program and the welcome screen appears (it shows the WabaVM's version) then everything is installed correctly. Click on the welcome screen to exit.